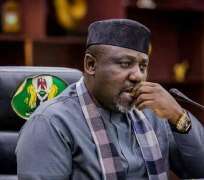 A Civil Society Organisation, Media Initiative against Injustice, Violence and Corruption-MIIVOC has called on President Muhammadu Buhari and the All Progressives Congress-APC to call the Governor of Imo State, Chief Rochas Okorocha to order over what it described as the massive looting of state resources under his watch. MIIVOC Executive Director, Dr. Walter Duru who made the call while addressing newsmen in Owerri, weekend warned that there will be consequences for the brazen stealing of property of the state. Duru further warned Governor Rochas Okorocha not to push his luck too far, adding that the most honourable thing to do is to find ways of laundering his already battered image by turning a new leaf.